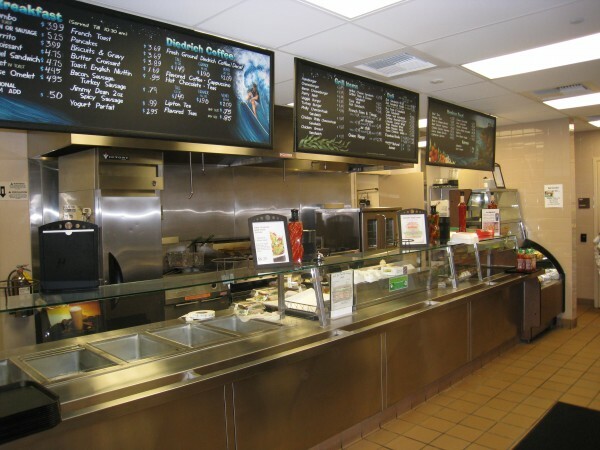 The Oceanside Campus food service, located on the upper level of the Student Center, is open for breakfast, morning breaks, lunch, and dinner during the school year and for morning breaks and lunch during the summer. Daily lunch specials, homemade soups, sandwiches, hamburgers, fries, salads, fruits, vegetarian foods, desserts, and hot and cold drinks are available Monday through Thursday, 7 a.m.–8 p.m., and Friday, 7 a.m.–2 p.m. Students can enjoy their meals in the dining room with an ocean view or in one of the patio areas. The San Elijo Campus has daily lunch specials, soups, pizzas, wraps, sandwiches, fruit, pastries, and many more daily menu items. The café is open for the fall and spring semesters Monday through Thursday. Breakfast is served 7–10:30 a.m., lunch is served 10:30 a.m.–2 p.m., and the Grab & Go Café is open 2–6 p.m. Both campuses have vending machines stocked with hot and cold beverages, candy, chips, and other snack foods.